Free download Password Safe latest version. 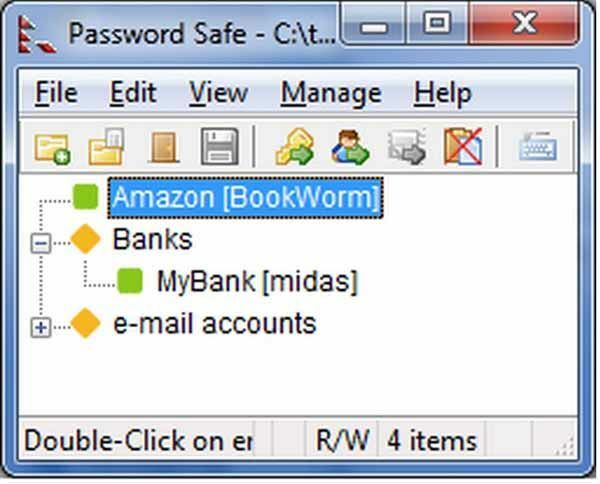 Password Safe is a password database utility. Users can keep their passwords securely encrypted on their computers. A single Safe Combination unlocks them all. PasswordSafe was originally designed by Bruce Schneier and released as a free utility application. Since then, it has evolved considerably. The following table has links to pages detailing the release history of PasswordSafe since the project was made open source. Whether the answer is one or hundreds, Password Safe allows you to safely and easily create a secured and encrypted user name/password list. With Password Safe all you have to do is create and remember a single “Master Password” of your choice in order to unlock and access your entire user name/password list. Password Safe allows you to manage your old passwords and to easily and quickly generate, store, organize, retrieve, and use complex new passwords, using password policies that you control. Once stored, your user names and passwords are just a few clicks away. Using Password Safe you can organize your passwords using your own customizable references—for example, by user ID, category, web site, or location. You can choose to store all your passwords in a single encrypted master password list (an encrypted password database), or use multiple databases to further organize your passwords (work and home, for example). And with its intuitive interface you will be up and running in minutes. Open Source – Most important, you don’t have to take our word for it. You can download the source code and inspect it yourself, or have someone else check it for you. If you’re really concerned, you can build the program from the sources you’ve downloaded and reviewed, instead of the binary files we build for each release. For the files we provide, you can check that they’re the ones that we’ve uploaded, and not tampered with, by checking the GPG cryptographic signature that’s generate for each file. Designed by Bruce Schneier – the original version was designed by renowned security expert Bruce Schneier, and we have his permission to say so. No back door / recovery mechanism – there’s no way for users (or developers, for that matter) to access the passwords without the master key. Hard to brute-force – In the absence of back doors, an attacker can try a brute-force attack, e.g., using a dictionary. Password Safe has safeguards in place to make this as hard as possible. File integrity checks: Even if the file’s encrypted, it’s not necessarily prtoected against unauthorized modification. Password Safe implements integrity checks on the file so that an attacker cannot modify it without knowing the master passphrase.